Inspired by Women's suffrage posters of the United States and Europe durring the early twentieth century. The work began as line drawings, digitized then finished with Adobe Illustrator, text applied in InDesign (the assignment was an InDesign focus).11x17" inject print. 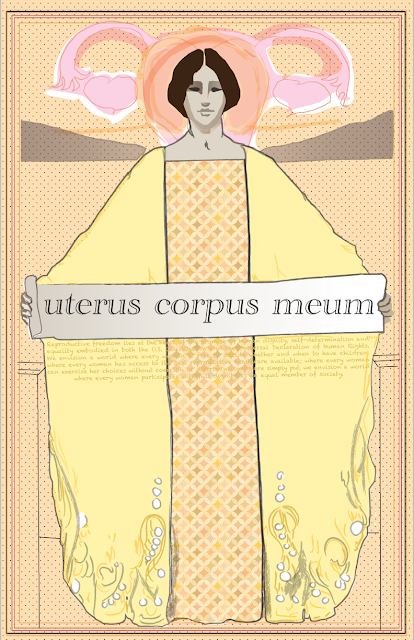 Uterus corpus meum; my uterus my body. "Reproductive freedom lies at the heart of the promise of human dignity, self-determination and equality embodied in both the U.S. Constitution and the Universal Declaration of Human Rights...We envision a world where every woman is free to decide whether and when to have children; where every woman has access to the best reproductive healthcare available; where every woman can exercise her choices without coercion or discrimination. More simply put, we envision a world where every woman participates with full dignity as an equal member of society." A woman's choices for family planning are entirely her dilemma to celebrate. The government or people trying to influence the government, locally, regionally or nationally have no place dictating how an individual plans her life. To block a woman's choice, whatever it may be, regarding reproduction challenges her liberty. Feminism reaches into every part of our lives (thankfully), that we are still fighting for our rights to have individual choices is absurd.